This Cathedral Windows rag quilt pattern is beginner-friendly, so don't hesitate to try the project, even if it's your very first quilt. Cathedral Windows rag quilts are made from individual circle sandwiches. Each sandwich contains a circular front, batting, and backing, all the same size. Some ragged Cathedral Window quilts are made with traditional quilt batting in the middle layer. However, batting cannot be placed within the seam allowances, since it wouldn't be stable in those exposed, ragged seams. Omitting batting from those areas takes time, and the end result is skimpy frayed edges. Blocks must also be quilted when batting is used. 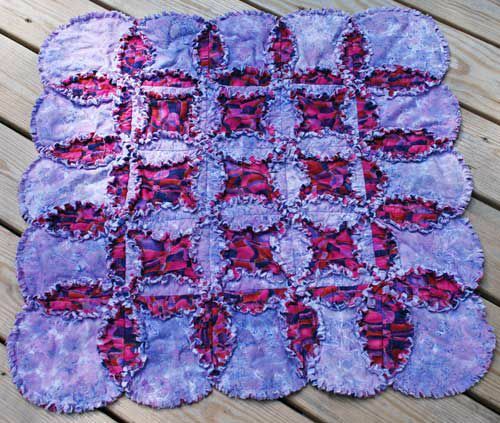 You can use flannel batting in rag quilts, because it is durable, doesn't need to be quilted and extends into the seam allowance to add depth, and even splash of contrasting color if desired. We'll cut circles that measure 8-1/2" in diameter—five circles are possible across the width of fabrics that measure 44" from selvage-to-selvage. Other diameters work just as well. Try 10" circles or choose a different size. For a miniature rag quilt, go with 3-1/2" or 4" diameter circles, and try a 1/4" or 3/8" seam allowance rather than the 1/2" seams we'll use for this larger quilt. If you don't want to bother with making a template, find a sturdy circular object to use instead, like a dinner plate, the lid to a large shortening or coffee can, or something similar. Finished sizes will differ, and so will yardage, but it's easy to add or subtract circles from rows to adjust the dimensions of the quilt. If you do make a template, try a window template, which makes it easy to mark both the cutting line and seam line without repositioning the template. Measure the width of your fabrics (not counting selvages). Divide the width of the fabric by the size of the circle you plan to cut; for instance, 43 wide fabric / 8.5 circle = 5.05, or 5 cuts possible across the width. How many circles do you need, and how much yardage will they require? 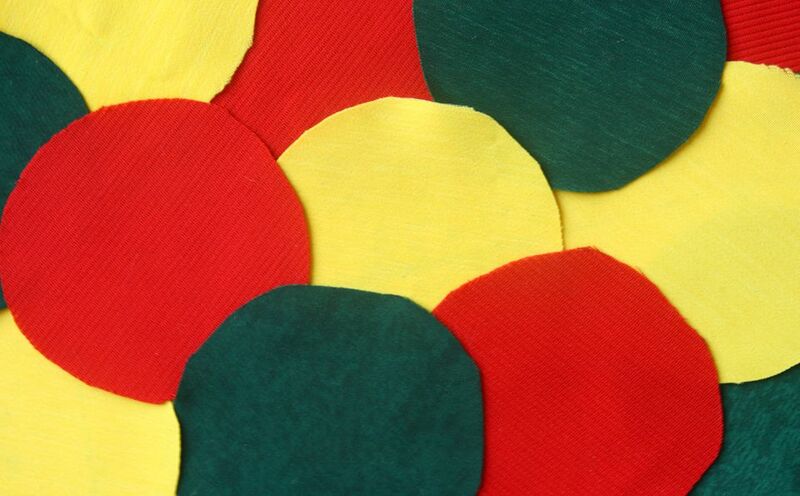 Example: for 50 circles that measure 8-1/2" (8.5), divide 50 by the 5 circles that can be cut across fabric width. The result—10 cuts are required along the length of the fabric. Be sure to plug in your own numbers. Multiply the number of cuts required along fabric length, 10, times 8.5" per cut—85". Divide 85" by 36", the length of a yard. For the circles in the example, that equals 2.36. Round up to compensate for errors and/or shrinkage—2-5/8 yards of each fabric will be enough. Do keep in mind that flannels are sometimes not as wide as other fabrics. Rounded up for that extra dimension, you'll need (12) 7" cuts along the length of the fabric. 12 times 7" = 84"
Up that figure to compensate for cutting errors, and in this case to be sure that 7 circles can truly be cut across the fabric's width. I would go with 2-5/8 yards each, or even a bit more to be safe. A decimal to fraction conversion chart might be of help during yardage calculations. Now it's time to cut circles for the Cathedral Windows quilt. This illustration shows the progression of marking a single circle, but your circles will actually be marked side by side along the width of the fabric. Circles can be marked along pre-cut 8-1/2" wide strips of fabric or side by side on the entire yardage. Make a window template using this 8-1/2" circle pattern. Print the pattern at 100%—do not allow your printer to scale the file. Find the fabric that will be on the front, ragged side of the quilt. Place pressed yardage (or fabric strip) right side up on a hard surface. Position your template near the top edge of the fabric, avoiding the tightly bound selvage. Use a fabric marking pencil to draw around the inner and outer edges of the circle template (use a pencil with a line that will stay intact during handling; loose chalk will rub off). Draw another circle next to the first, letting outer lines touch to conserve fabric. Continue drawing circles across the fabric. Repeat until you have 25 circles. Make a 5-1/4" x 5-1/4" square template (not a window template). True size is actually a tiny bit larger than that, but the difference is taken up by the seam line). Center the square template inside a circle, adjusting it until its four corners all touch the inner line as illustrated (align all in the same manner for directional fabrics). Trace around the square. Stack fabrics, placing your marked fabric right side up, the flannel layer under it, and the backing fabric right side down behind the flannel. Press to help fabrics adhere to each other (or place a pin at the center of each circle to keep fabrics from shifting). Cut out circles on the outermost line, making your cuts through all three layers. Sew each circle sandwich together on the inner, circular line. Seams may be slightly visible when the quilt is finished (depending on the amount of fray) so use a neutral thread color or one that works with your fabrics. Clip into each seam allowance, making cuts about 1/4" apart and perpendicular to the seam line, but ending before the seam. Directions will sometimes say to clip seam allowances after the circles are sewn together. But there are some advantages to doing it beforehand. If you cut too far inward and clip a seam (which is easy to do) later sewing steps will correct the problem. Clipping seams now eliminate the possibility of accidentally clipping into the assembled layers. The clipped edges can get in the way a bit when you are sewing circles together (pressing helps eliminate the problem). To calculate the square size for any circle, divide the circle's finished size (1" less than its cut size) by 1.42. Round to the closest dimension that you can easily cut. Or, align a square ruler on the seam until three of its sides rest on the same number. Use that dimension for your template. The squares drawn within each circle are the lines used to connect the Cathedral Windows sandwiches. The photograph illustrates two circles that are already attached (left). Before you begin, arrange the circle sandwiches into five rows of five circles each. Do you want the same fabric to be visible on the front of the quilt, or would you prefer to turn some around for a different layout? Play with the possibilities before you begin to sew. If you flip-flop fabrics from front to back in some areas, you will most likely need to draw a square within the circle of the unmarked fabric, but that's easy to do during assembly. To preview the layout, use pins to attach circular sandwiches along marked lines. flipping the circular sections into place just as they'd be after seams are sewn. Sandwiches are positioned backing-sides-together for sewing. If you reverse some pieces, the fabric used for each will not be consistent. Always ask yourself "which side am I using for the backing" before you sew. Do not sew across circular seam lines. It's important to sew right up to the line, and you can go a stitch beyond, but no further. Grab two of your circle sandwiches. Align the sandwiches, backing sides together. Make sure the drawn squares of each sandwich are matched by stabbing a pin through the top right corner of one circle's square and following through to pass it through the corner of the circle below. Repeat to match corners at the bottom right of the circles. Sew a seam along the drawn line, backstitching at the beginning and end of the seam. Do not sew more than a stitch past either circular seam line. Add another circle to the right side of the unit. Continue adding circles until the row is complete. Press the row gently. Hold down ragged areas between circles with pins if you like. Sew around each of the ovals created where circles are joined, placing your seams on top of or slightly to one side of the seams used to connect all parts of the sandwiches. Construct the remaining rows of the quilt. This photo shows the front of an inner row of a Cathedral Windows rag quilt, with three circles of brighter fabric in the central area of the row, and the contrasting fabric on each end. Rows for the Cathedral Window rag quilt are sewn together much like the method used to attach the circle sandwiches to each other, sewing individual sandwiches together along the lines created by drawn squares, and not sewing past existing seam lines. Align two rows backing sides together. Starting at the left edge, pin and align the drawn lines for the first circle in each row. Sew a seam on the line, backstitching at its beginning and end. Do not sew across the seam line used to sew each sandwich together, and be sure to push the contents of that allowance aside as you sew the straight seam. Sew the remaining circles together in the same way, one by one, until the two rows are completely joined. Open the curved areas, pressing them down and pinning if necessary to keep them flat. Sew the horizontal curves to the quilt as you did the curves between units in rows—with one difference. Sew a continuous line along the curves, snaking in an S-like pattern as you reach the intersection of two arches. Turn around and sew in the opposite direction. Sew a reinforcing seam around the outer edges of the quilt, right next to the original curved seam lines. Wash the quilt. Clip loose threads and wash again for fluffier rag seams. Inspect the back of the quilt and hand sew any areas with gaps.